Troubleshooting pages take you through trouble spots so that you know how to avoid them. Calligraphy drills act as warm ups, use these to get the pen started and the ink flowing before you begin a template. If you would like more help with your calligraphy, we have a YouTube channel with tutorials so click here to view. 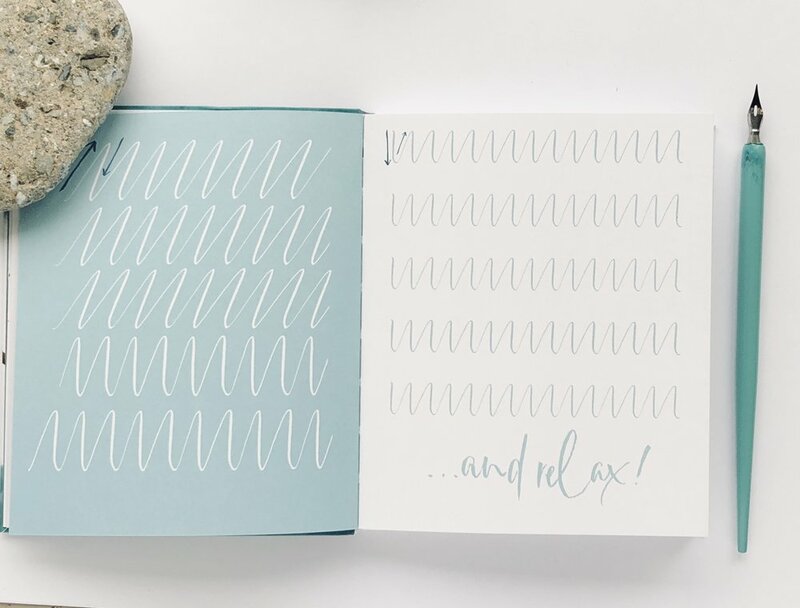 The Little Book of Calming Calligraphy is here. This handbag sized edition is perfect for those that are already hooked on calligraphy and would like to progress. 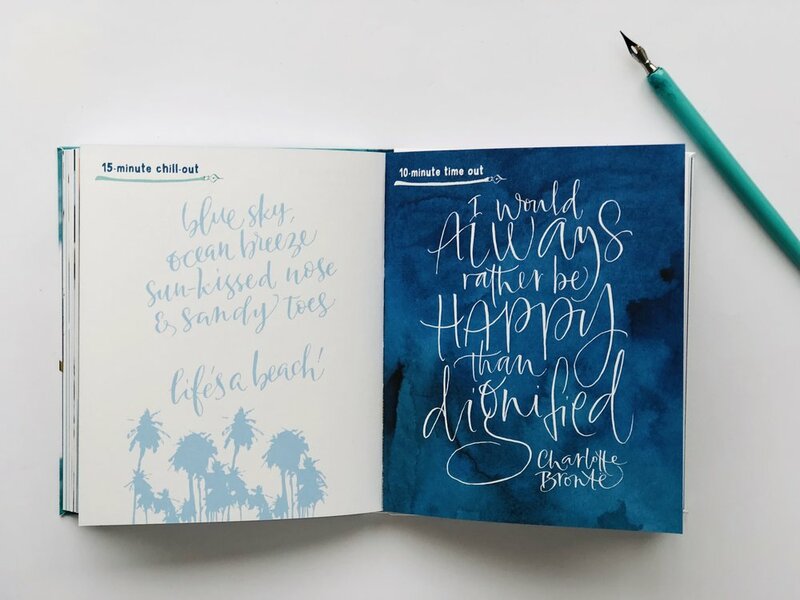 With over 100 quotes, all made into calligraphy by Kirsten Burke & set against pretty water colour washes, or ready for you to add your own touches to, you will never be without inspiration. By timing each piece of calligraphy with our team of calligraphers working over each page, we let you know how long each calligraphic exercise will take you. The idea is that whenever you have a spare half an hour or so, you can grab your book & pen and turn to a page that matches the time you’ve got. 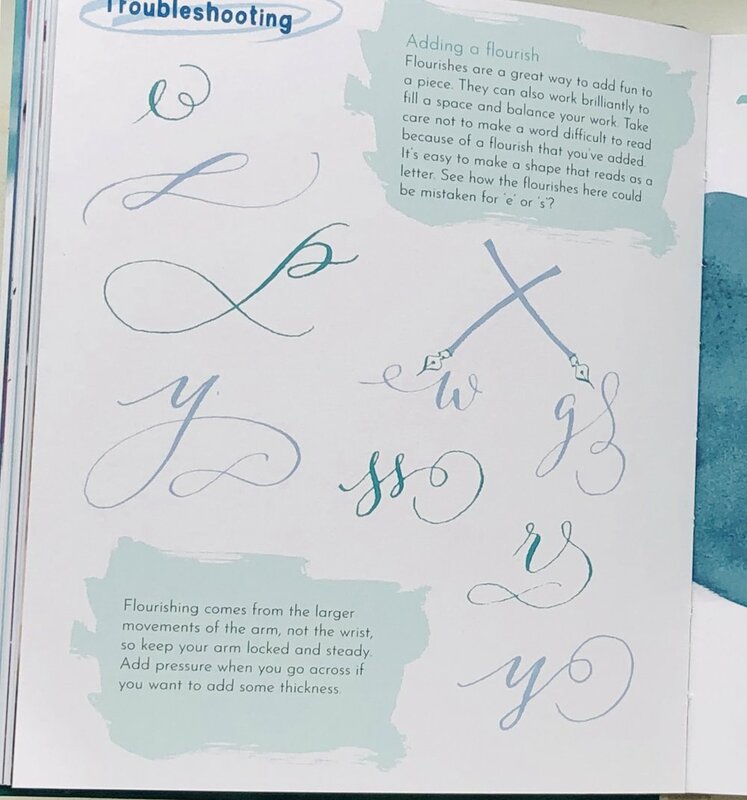 With trouble shooting pages, tips, warm ups and options for more challenging options, you can use this pretty book to wind down whilst all the time, improving your calligraphic skills. If you haven’t done any calligraphy before, work through our book Secrets of Modern Calligraphy before you buy this book. It will guide you through all the basics, so you will be ready for these more advanced templates and projects. Warm Ups get you ready. I recommend a Leonart 30 nib and a universal holder to begin with. Working over the templates will allow you to practice your calligraphy whilst making pretty pieces of work. Cut the ones you like the best out of the book and frame. It doesn’t have to always be lettering, working with the pressure and release of your pen is the key to better calligraphy. You can do this just as well creating patterns and shapes, like this flower pattern. So we invite you to take some time out for yourself, and become absorbed in your hand lettering. If dip pen isn’t your thing, you can work into this book just as well with a small brush pen, or the smaller end of our Kirsten Burke brush pen.